As it goes in South Australia, so it goes in Germany: the attempt to run on sunshine and breezes has led to rocketing power prices, energy poverty and a grid on the brink of collapse. Here’s NoTricksZone on the German debacle. It’s the paradox of the German Energiewende (transition to green energy): power exchange market prices are lower than ever before, yet consumers are paying the highest prices ever – with no stop in the increases in sight. Moreover, the more green electricity that is fed into the grid, the more coal that gets burned. If today’s German power grid sounds like a horror story of communist state-planned management, it is because it is in fact so. And unsurprisingly the whole industry is well on its way to a Soviet style meltdown. For this we have former East German communist Angela Merkel to thank, in part, along with her spineless West German CDU cohorts, many of whom eagerly hopped on the gravy train and let the country be taken for a wild ride. Today German Manager Magazin here brings us up to date on the country’s “greening” power grid — taking a look at the control center of grid operating company Tennet. Manager Magazin calls it the heart of the German Energiewende. Here a team of engineers decide how much gets fed into the various grids and which windparks are allowed to feed in and which aren’t. The reason for the grid instability: the growing amount of erratic renewable energy being fed in, foremost wind and sun. Manager Magazin writes that there are always four workers monitoring the frequency at the Tennet control center, just outside Hannover, making sure that it stays near 50 Hz. Too much instability would mean a the “worst imaginable disaster: grid collapse and blackout“. Manager Magazin reports Germany now has a huge oversupply of power flooding into the grid and thus causing prices on the electricity exchanges to plummet to levels never seen before. 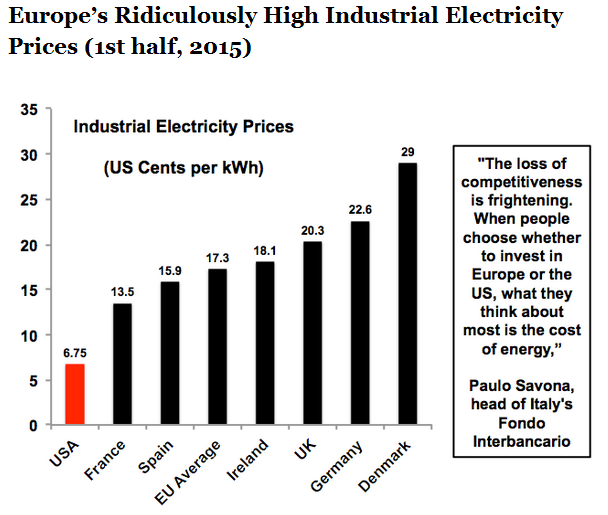 Yet, renewable electricity producers are guaranteed, in most cases over a period of 20 years, exorbitant high prices for their energy. This means power companies have to purchase at a high price, yet can get only very little for it on the exchange markets. The German business magazine then writes that once again consumers will be getting the serious shaft, as the feed-in subsidy consumers are forced to pay will climb another 0.53 cents-euro in 2017, bringing the total feed in tariff for power consumers to 6.88 cents-euro for every kilowatt hour they consume. Another huge problem is that by 2022 Germany will be shutting down the remaining nuclear power plants, a source that much of Germany’s industrial south relies on. In the meantime, the necessary transmission lines to transport wind power from the North Sea to the south are not getting built due to protests and permitting bottlenecks. This puts Bavaria’s heavy industry at risk. manager writes that the transmission lines are not expected to be completed by 2025! In Part 3 of its report, Manager Magazin reports that operating a power grid has become more complex and costly, due to the renewable power, and that the Energiewende has turned into “ecological foolishness“. Weinreich describes how on stormy days wind parks are forced to shut down to keep the grid from frying. And the more wind turbines that come online, the more often wind parks need to be shut down. This makes them even more inefficient. Not only do wind and solar feed in their power on a part-time basis, but now so do the conventional power plants as well — all according to the whims of the weather. An d too often they run at levels well below peak efficiency. The costs of all the inefficiencies get passed on to the consumers. Tens of thousands have been forced into “energy poverty”. Weinreich reports that the grid is so unstable that in 2015 it was necessary for Tennet to intervene some 1400 times. In the old conventional power days, it used to be only “a few times a year“. In Part 4, Manager Magazin reports that all the intervention and shutdowns of runaway wind parks are “costing billions” for the consumers. Alone in 2017 Tennet says grid operating fees will rise 80%, translating to 30 euros more burden each year for each household. The money of course ends up flowing from poor consumers and into the pockets of wealthy solar and wind park operators and investors. Little wonder that many experts call the German Energiewende the greatest bottom to top wealth distribution scheme ever created. Climatism says. 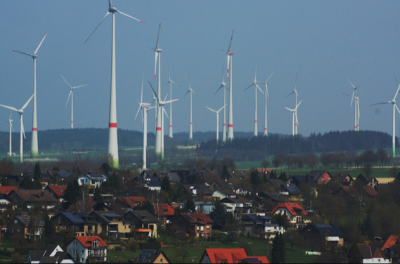 “Every time an industrial wind plant is installed a corresponding fossil plant has to be”. Response: 1) Windmills do not produce usable electricity. The fossil plants are not being built to back up wind. They are being built because nuclear is being closed down. The windmills are a con. 2) Why spend billions on transmission lines to transport useless and dangerous harmonics to the south? Humans are meant to learn from history and mistakes, right? Then why do we continue down the feel-good, unreliable, costly, weather dependent energy path?? Is the virtue-signalling pastime of “Saving The Planet” that important as to destroy people’s lives and wreck economies?! And again, keep in mind that every time an industrial wind or solar plant is installed, a corresponding fossil fuel plant has to be created or cranked up to cover the grid instability for when the wind don’t blow or when the sun don’t shine! Where’s the “CO2” savings in that? There are none of course, they simply increase with the production, installation and maintenance of wind and solar plants, on an industrial scale! Climate feel-good insanity on stilts.